For lunch today, (and dinner last night) I had this craving, but I'm not a fan of cheese substitutes. Like most things in life, they are good in moderation, and that's how I use substitutes...in moderation, and every time I make a dish with cheese substitutes I usually finish up my meal thinking that the meal was in no way profitable from using these substitutes. That's how I felt last night when I made a grilled cheese sandwich using a vegan mozzerella substitute, basil, red onion and avocado. Sure it was delish but I couldn't help but think I would have liked it better if there wasn't any "cheese" on it. 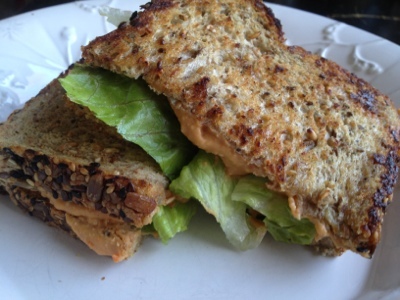 So here's how I fixed my grilled cheese sammich craving in a healthier-and-cheaper-than-overly-processed-overly-priced-vegan-cheese-substitutes way. Put all that stuff up in yo blender and do the dang thing. 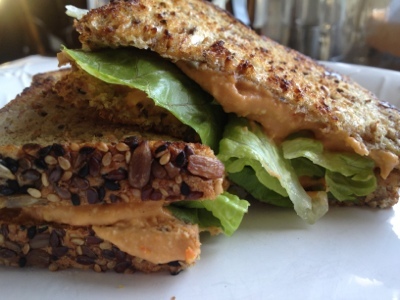 Sandwich between two vegan buttered slices of your favorite vegan bread (or tortillas...this would make bomb quesadillas) and grill to your liking on the range top.